Hikers, Walkers, ramblers, runners and joggers - Spend your whole day walking and running without muscle strains, cramps, and fatigues. Outdoor enthusiasts and Athletes - Less muscle strain means you can train harder, feel stronger and perform better in the gym and on the field. Jobs that involve lots of standing - Bring more energy into your legs! No more foot pain from standing all day long at work! Air Travelers - Our Sleeves help reduce pain by improving blood flow in the legs. People with leg problems - Prevent and reduce symptoms of Shin Splints, Calf Cramps, and Pulled Muscles. AVOID INJURY: Improve blood circulation. Prevent unnecessary injury and pain by offering optimal muscle support during everyday activities. SPEED UP RECOVERY: The compression helps relieve muscle pain as well as aids in muscle recovery & rehabilitation. WARMING EFFECT: Support full motion flexibility and Warm up your calf effectively. Important! Measure the thickest, fullest part of your calf (circumference) to determine the size. Your satisfaction is our guarantee! If you aren't happy with your purchase for any reason, let us know and we'll refund your money back or send you a replacement! That is how confident we are that you will LOVE your calf sleeves. 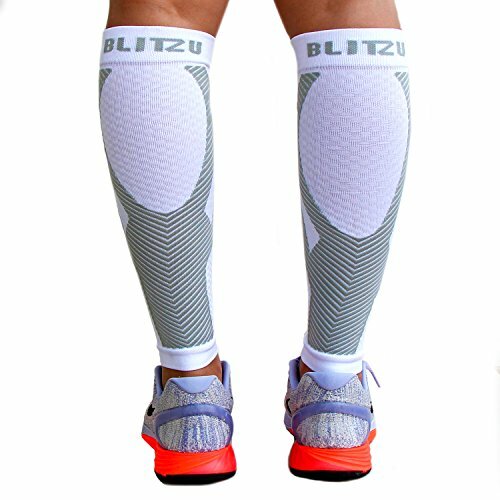 Click on the Add to Cart button, and have your Blitzu Calf Sleeves shipped today!
? COMPRESSION THERAPY TECHNOLOGY - Provides true graduated compression to promote blood circulation and oxygen flow. Prevents injuries such as cramping, fatigue, soreness and swelling. Perfect for muscle recovery, spider, varicose veins and diabetic. Nursing mothers to Extreme Athletes - Everyone will Benefit. #1 RECOMMENDED Therapy Sleeves on the market! ? BLITZU® KINESIOLOGY TAPING DESIGN - One-of-a-Kind compression sleeves that combine the stability of kinesiology taping with the performance of compression fabric. Designed to specifically target shin splints. This sleeve provides the same relief as kinesiology tape without the worry of getting "taped up" by a trainer. It helps stabilize muscles, prevent pain, injuries, and shin splints due to running, basketball, or everyday activities. Instant comfort & support GUARANTEE! ? GET INSTANT RELIEF - Do you suffer from shin splints, calf pain or swellings in the feet? Do you travel a lot or are on your feet all day? If yes you'll love our compression sleeves. These shin splint compression sleeves aid in mitigating shin splints, preventing calf cramps, protects legs from minor scratches & knocks. Don't price shop cheap imitations that just have tight elastic bands. Get these proven calf sleeves with true graduated compression, nothing else compares! ? BUY IT NOW AND FEEL THE DIFFERENCE INSTANTLY - 100% SATISFACTION GUARANTEE- Your satisfaction is our guarantee! We Promise These Are The Most Perfect Fitting, Maximum Swelling Reducing, Highest Pain Relieving, Longest Lasting Compression Calf Sleeves You Will Ever Own. If you are not satisfied for any reason, let us know and we'll refund your money back or send you a replacement! That is how confident we are that you'll LOVE it! DON'T WAIT, ADD IT TO THE CART NOW! ? DESIGNED FOR EVERYDAY USE - Bring more energy into your feet. Design for extra support of the posterior & anterior calf muscles & achilles tendon. Pin-point compression provides targeted support where it is needed the most. It's perfect for jobs that require you to be on your feet a lot. It's a must have for any leg intensive activity such as Marathon, Walking, Jogging, Running, Hiking, Gym Fitness Training, Basketball, Cycling, Weightlifting and more. Perfect for extreme races and long runs!